Discover our favourite hotels, restaurants, nightlife and things to do in Milan right now. This insider's city guide has been a long time in the making. We've eaten in countless Milan restaurants, dined in the best foodie gems and visited the latest local hotspots. We've also asked the most discerning locals we know to share their favourite hangouts – whether brand new or classic institutions. We bring you our hand-picked selection of our favourite places in Milan right now. Whether you're looking for a chic design hotel, a cosy boutique gem, or a luxurious 5-star haven, here is our pick of the best places to stay in Milan. With an enviable location only minutes from La Scala and Milan's glamorous Golden Triangle luxury shopping district, the Mandarin Oriental sets the bar for luxury in Milan. Set across four elegant 18th-century buildings, the hotel features glamorous interiors designed by architect Antonio Citterio. The spacious rooms and suites offer bespoke furnishings, oak floors, plush velvets and spa-like bathrooms in Italian marble. After an afternoon’s indulgence at the state-of-the-art spa, sip cocktails in the dramatically monochrome Mandarin Bar before enjoying a lavish meal at the Michelin-starred Seta by chef Antonio Guida, the Mandarin Oriental’s elegant courtyard restaurant. Whether you're looking for a fabulous foodie dining spot, the city's best food market, or an authentic local trattoria, here is our pick of the best places to eat in Milan right now. 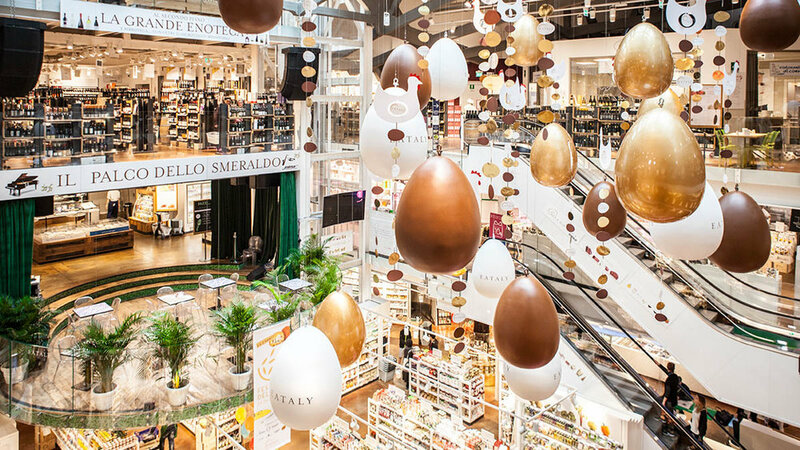 One of Milan’s most eagerly anticipated openings, the Eataly food emporium is home to 5,000 square metres dedicated to Italian cuisine, produce and fresh ingredients – including pasta, wine, cheese, fresh meats and chocolate. You'll also find over 15 cafés and restaurants, including the Michelin-starred Alice restaurant, along with an in-house stage which showcases an exciting program of free events and music concerts. A must-visit for lovers of Italian cuisine. Over 90 years ago, Beatrice Ruggeri (Bice) and her husband Gino decided to open a classic Milanese trattoria in 1926. Today, Il Ristorante da Gino e Bice delivers the warm hospitality and Italian soul food which inspired Gino and Bice’s first ristorante to over 15 international outposts. Enjoy a Tuscan-inspired feast of homemade pasta, creamy risottos and fresh seafood. A culinary gem hidden just off the luxury shopping hub of via Montenapoleone, Il Bacaro del Sambuco is a favourite of Milanese locals due to its menu of simple and traditional Italian fare. Inside Il Bacaro del Sambuco's airy dining room, you'll find only a handful of marble tables, while outside, a picturesque ivy-clad courtyard offers the perfect setting for elegant alfresco dining. Feast upon fresh paccheri pasta served with pachino tomatoes and basil. The original Langosteria restaurant in Milan is a staple of the city’s seafood scene, and we also love its sister-restaurant, Langosteria Bistro, for its sumptuous Parisian bistro aesthetic. Enjoy fresh oysters, lobster linguine with cherry tomatoes, and spaghetti calamari e bottarga (spaghetti with squid and mullet). You’ll find Langosteria Bistro nestled amongst the canals of Milan’s Navigli district. Whether you're looking for the perfect cocktail, the city's best wine bar, or a late-night club, here is our pick of the best places to drink and party in Milan right now. 1930 comes straight from the imaginations of Flavio Angiolillo and Marco Russo, the award-winning cocktal duo behind Milan’s trendy MAG Café. As 1930 is an invitation-only drinking den, you’ll need to charm the staff at MAG Café to secure a coveted reservation – if you’re lucky, your dedication will be rewarded with directions to Milan’s only hidden, speakeasy-style cocktail bar. Step within the dark and sultry world of 1930 Cocktail Bar, where quirky curiosities include plush antique chairs, beautiful gramophones, vintage sewing machines and china teapots. Behind the bar, 1930’s dapper mixologists are masters of their craft, shaking inventive cocktails to the sultry sounds of Edith Piaf and Ella Fitzgerald. Don't miss these incredible Milan museums, cultural landmarks and local experiences. Climb the towers of Milan’s iconic Il Duomo cathedral and admire the incredible sculpture work accompanied by panoramic views of Milan. Another quintessential landmark is Leonardo Da Vinci’s masterpiece, the Last Supper, situated next to the Santa Maria delle Grazie church. Italy’s premier opera house, the Teatro Alla Scala opened in 1778 and invites visitors into an opulent world of red velvet, glittering chandeliers and box seats. The Torre Velasca is a unique 1950’s skyscraper which towers 100 metres above the city, while the Pirelli Tower soars 127 meters high and offers beautiful panoramic views at sunset. For a fun and efficient way to explore the city, choose a guided bus tour with City Sightseeing Milan, during which you can leisurely hop-on/ hop-off as you like. One of the best cities in Italy to savour homemade gelato, Milan is home to a wealth of excellent gelaterias. One of the most popular is CioccolatItaliani, a stylish wonderland of Italian ice cream. The award-winning Grom is the vanguard of the new generation of gelaterias, offering a superb range of natural, colourless gelati made with ethically-sourced ingredients such as Venezuelan cocoa beans and Syrian pistachios. A more traditional gelateria is Gelateria Marghera, a favourite of local gelato aficionados. One of the largest surviving citadels in Europe, Castello Sforzesco was once the powerhouse of Milan’s ruling family, the Sforzas. Today, the castle hosts a superb collection of art ranging from the early Middle Ages to the 18th century. Housed in a beautiful palazzo that was once a Jesuit college and even an observatory, Pinacoteca di Brera showcases one of Italy’s finest collections of Italian paintings, including works by Raphael, Tintoretto and Mantegna. Pinacoteca Ambrosiana is Milan’s famous library and art gallery which was founded in 1603 and has served as a learning institution for over four hundred years, hosting a priceless collection of treasures that include sketches by Leonardo da Vinci. Theatre lovers will love the La Scala Theatre Museum, where original costumes, paintings and statues detail the history of Italy’s famous opera house, while design connoisseurs should visit the Triennale Design Museum, which hosts a rotating program of art, photography and furniture exhibitions throughout the year. The luxurious Bulgari Spa is the peaceful spa retreat at the 5-star Bulgari Hotel, designed in a palette of emerald green with a shimmering gold-tiled swimming pool. Another popular day spa in Milan is the futuristic Atomic Spa Suisse, renowned for its high-tech wellness centre with a heated pool with whirlpool massage, sauna, Turkish bath and marine tepidarium. A water-wonderland, Terme Milano is a complex with hot springs and heated pools, waterfalls and saunas. Piscina Cozzi is also a historic local swimming pool. Home to the flagship stores of Italy’s most well-known designers such as Giorgio Armani, Gucci and Versace, the famous Quadrilatero d’Oro shopping area is a luxury shopping haven which concentrates around Via Monte Napoleone, Via Spiga, Via Sant’Andrea and Via Borgospesso. The historic Galleria Vittorio Emanuele II is one of the oldest shopping arcades in the world and is a glittering example of the 19th-century Belle Epoque architectural style, and is also home to many chic boutiques. One of Milan’s most famous concept stores is 10 Corso Como, a cutting-edge fashion boutique, art gallery and book store. Another popular Milan design store is Spazio Rossana Orlandi, a labyrinth-like space of designer furniture and installations located in Milan’s edgy Magenta district. Lovers of interior design should also visit the flagship stores of Artemide, B&B Italia and Cassina in Milan. Located 90 minutes drive north of Milan, Italy’s Great Lakes region offers the perfect weekend escape. Highlights include the picturesque Lake Maggiore, a romantic vision of sleepy cobblestone villages and secluded gardens; the 16th-century Borromeo Palace, set across a trio of picturesque islets; Lake Como, a popular retreat for aristocrats and wealthy locals since Roman times; and the beautiful Lake Garda. Located less than one hour from Milan, Bergamo is home to a famous citadel, where you can admire the beauty of the Duomo, the Palace of Reason, the Basilica of Saint Mary Major and the monastery of Sant'Agostino, dating back to the 13th century.